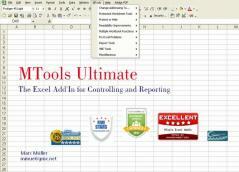 AddIn MTools ultimate is a must have tool for any Excel professional. It greatly expands and improves the capabilities of Microsoft Excel by providing users with a large, high-quality collection of time saving tools. Even basic Excel users will see that MTools plugin helps them create their spreadsheets much faster than professional Excel users who aren’t using the plugin. With MTools you will be able to impress your boss with your improved work speed and the reliability of your spreadsheets, which will ultimately give you more free time. Free and timely unlimited and unrestricted edition and Ultimate paid edition are available, and the key benefits of Ultimate Edition are additional functions and free lifetime updates. MTools plugin will help you with work in 40 different unique utilities that can cover following main areas: handling of multiple excel files for specific tasks, password removing, data analysis, report development, report creation, name management, link management, management of cells in protected sheets (for example copying of data in unlocked cells of protected sheets), Microsoft Excel bug fixing (for example saving of uncalculated Workbook), and VBE Tools (for example removal of VBA comments). MTools Ultimate Excel Plugin is compatible with Microsoft Excel 2002 and higher and it is a stand-alone plugin, and it doesn’t requires any installation, it will be delivers as a regular XLS file with the option to install it as a plugin to your MS Excel.